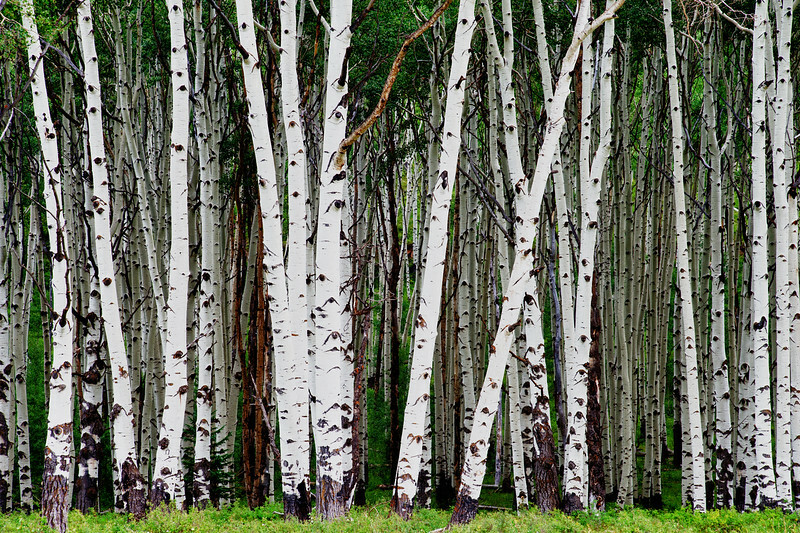 As I've said before, I love Aspen trees. I would have loved to have been in Utah or Colorado at the time of their leaves turning that brilliant, golden yellow color. Nevertheless, I enjoyed them in their late summer stage too. I loved that this stand was so thick & I could see deep into their world and find their unique markings far from the front set of trees. This thick stand of Aspens brought to mind many of Bev Doolittle's prints. I am a big fan of Bev Doolittle. This shot reminded me most of her "Sacred Ground" print. Also, the triptych "Two More Indian Horses" (which hangs in my living room). I would highly recommend that you google her Sacred Ground Print, and I think you'll see why this shot put me in mind of that piece of art. Have a strong and steady day! I love the composition of this image. I wanted to look inside and beyond the trees. Great shot. A very beautiful shot. Wonderful trees. Outstanding! I've got a photo somewhere similar but yours is better.